Green building articles abound, but it's important to note the subtle differences in perspective, which may change depending on the writer's geography. An article may give green building advice that doesn't make sense in your geography. Take this Houston article for instance. It's a good read. In Houston, the climate requires an innovative balance of green building techniques. Houston is hot and humid. I won't say it's the armpit of America, but it's hard to keep dry in that place. Here are a couple examples of localization in green building. Passive Design - Houston architects suggest putting most of your windows in a north/south orientation because the east/west orientation draws too much heat into the home and doesn't allow exposure to the cool breezes that blow from the southeast in the summer. 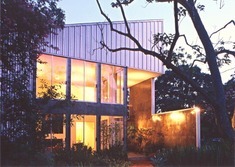 Materials - Houston architects will building with metal, as opposed to brick or stucco. Metal reflects the sun, while brick holds in heat and stucco is prone to mold. Unfortunately, metal doesn't work for all applications, so you have to balance and make trade-offs. Rule: Consult a knowledgeable professional to pick the optimal green building strategy that effectively considers the ramifications of the local geography and materials on your site. It'll pay dividends later when you actually start to occupy the building and use it. Pictures via Cameron Armstrong Architects, a Houston architectural firm with several metal homes in their portfolio. Good point about building appropriately for climate. I just got back from the Building Green conf. of the National Homebuilder's Association (in St. Louis). Some of the most interesting breakout sessions were about building science. For example there are lots of considerations in hot climates where buildings are air-conditioned. Hot air moves toward cold air and can cause mold in walls. I've yet to run across an expert who describes good building science in my climate (Colorado).